hair care | Stylistic Inc. Washing your hair on a daily basis can result in dull hair, split ends, and a dry scalp. Washing your hair on a daily basis can be time-consuming and expensive. The concept of “dry shampoo” is now a reality for many women. Many women prefer to go a day or two without washing their hair and dry shampoo makes it possible. Dry shampoo has many benefits and it has become a top-selling product for several reasons. 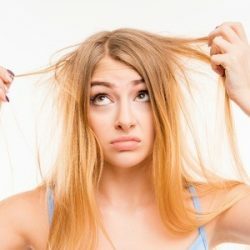 Although it is healthy to go one or two days without shampooing your hair, it can still result in our hair feeling greasy and dirty. Spritzing it with a little water doesn’t do anything for us and using excessive hairspray does too much. If you want to skip a wash, use dry shampoo to get your hair where you want it to be. Dry shampoo will remove the dirt and oil from your hair and scalp, making your “day old” hair clean and fresh. Dry shampoo can help protect your hair against humidity or rain, regardless of your hair’s texture. Spraying a bit of dry shampoo at your roots will help spruce your air up and prevent it from getting too flat in humid temperatures. You can also now purchase mousse-based dry shampoos, which are ideal for thick curls or thick waves, because they help keep frizz to a minimum. For many women, washing their hair is a major time commitment. Between shampooing, conditioning, drying, and styling, it can take an hour to “wash their hair” because the effort doesn’t stop there. If you are short on time but need your hair to look presentable, dry shampoo is a great option. It takes less than a minute to apply but will give you all-day results. Below are two affordable and high-quality dry shampoos to consider. This Suave dry shampoo is roughly $5.00 at most drugstores but the quality is priceless. The keratin infusion will especially help those who struggle with frizz. It will keep hair smooth and absorb the unwanted oils on your scalp. This Pantene dry shampoo also comes in at around $5.00, making it another affordable option. This dry shampoo will provide your hair with a fresh-smelling scent throughout the day and is well-known for its smell. This product will leave your scalp feeling refreshed with minimal effort. There are plenty of dry shampoos out there now, experiment with them to find what you might like the most. For more hair advice, visit Stylistics Inc.’s blog.